The Certina DS Podium line has the expert touch when it comes to blending elegance with undeniably sporty influences. The DS Podium Chronograph and its precise automatic movement in a brushed/polished case follows in those footsteps. Bright, open and at ease next to any style of dress, it brings together chrono functions, a see-through case back and traditional Certina quality. The DS Podium’s classy sunray-finished silver dial immediately sets the tone, with its bright surface crisply outlined by a black outer rim and broad, black nickelled HM hands, both trimmed with Superluminova to ensure great legibility in all lighting conditions. The Swiss Made ETA automatic movement provides 6h, 30min, 60sec chronograph functions, activated by black PVD-tipped push-buttons next to a protected crown inscribed with the letters “DS”. Arabic numerals are used only at 3 and 9 o’clock, in a strong design touch which reserves the vertical axis for the two black chrono counters (with red indicator hands) and a date window at 6 o’clock. 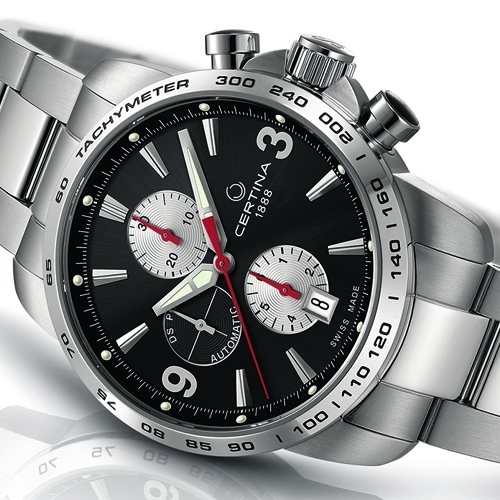 The 42mm brushed/polished 316L stainless-steel case is equipped with a tachymeter-scale bezel, a sapphire crystal treated with anti-reflective coating, and a see-through case back that allows watch connoisseurs to admire the movement and rotor, decorated with the traditional Certina turtle logo, perennial symbol of reliability and durability. The DS Podium Chronograph – Automatic is equipped with the famous Certina DS Concept – as its name suggests, to ensure water resistance up to a pressure of 10 bar (100m). The model comes with a white-stitched black leather strap held by a twin push-button butterfly buckle. Other versions are available, including a particularly sporty model with a black dial and silver chrono counters, and a three-row (polished central row) steel strap.